We think we offer a great service to some fantastic campsites in France with great accommodation. But dont take our word for it - see what the experts at the newspapers have to say! 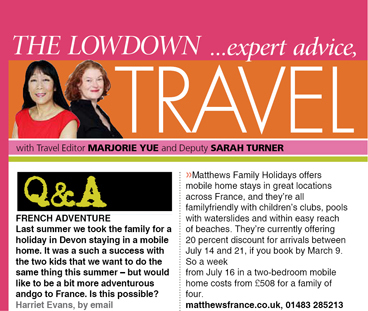 Fred Mawer in his article about French Beach and Camping Holidays in the Telegraph of January 2017 includes Matthews Holidays as a ‘Long established operator - offering camping holidays using mobile homes’. He states that ‘Many French campsites have direct access, or are near to, beaches, particularly in Brittany and along the west coast’. The kids deserve some sun this summer, especially after last year’s washout, but cash is tight. The answer: make for the Vendee region, tucked away under Brittany. Its microclimate makes it one of the sunniest spots in France, with nearly 2,500 hours in an average year, and there are plenty of good-value holiday parks. A short walk from a vast, sandy beach, Le Clarys Plage has a new water park with rides and pools, and there should be plenty of British kids for yours to team up with. Matthews Holidays (01483 285213, matthewsfrance.co.uk) has a mobile home sleeping mum, dad and three children from £398/£929 – and that includes Dover-Calais ferries. ... Mobile homes on sites with direct beach access; and Matthews Holidays (01483 285213; matthewsfrance.co.uk) Discounts up to 18 per cent for bookings made in January. At the southern tip of the Quiberon peninsula, far from Brittany’s crowds, lies Plage Conguel, a necklace of blonde sand surrounding a rocky point that, one day, like Quiberon itself, will succumb to the waves and become an island. With one side facing the Atlantic swells and the other overlooking sheltered Quiberon Bay, you can choose belle or sauvage, and at high tide the beach becomes a series of family-sized rocky coves, with views across to Belle-Ile. Best for: Beachcombers, castle builders. Details: Just across the road is the lively Camping le Conguel, where a high-season week starts at £685 for a family of four with Matthews Holidays (01483 285213, www.matthewsfrance.co.uk). For a more personal service, consider Matthews Holidays (01483 285213; matthewsfrance.co.uk) Discounts up to 18 per cent for bookings made in January. ‘France remains as popular as ever with the British and it’s easy to see why. Simple and cheap to get to, inexpensive when you’re there and with a multitude of great sights and wonderful food it really is a holiday paradise. Self-drive holidays give you the chance to see this wonderful country at your own pace and to roam wherever you fancy. Taking the car also allows you to bring as much luggage as you like –perfect for camping trips. Camping in France is great – the sites are cheap, well maintained, perfect for kids to explore and offer high-quality accommodation in both luxury tents or mobile homes. ‘Iris Matthews of family camping specialists Matthews Holidays says The figures are very encouraging this year – we haven’t seen such a surge in the number of people looking before. It shows that a hop across the channel is leaping to mind as the logical money-savvy answer for a relaxing break in belt-tightening times.